Dave was born and raised in Calumet, Michigan, graduating from Calumet High School in 1961 and Michigan Technological University in 1966. Upon graduation from Michigan Technological University he received his commission as a Second Lieutenant in the United States Army. He served a tour of duty in Vietnam as a First Lieutenant, receiving the Bronze Star Metal for meritorious achievement in ground operations against hostile forces. Dave and his wife, Raynelle have two children, Jason & Dana. 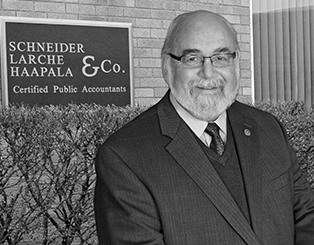 During his accounting career, Dave has acquired significant experience in estate planning, estate and gift taxation, employee benefit plans, financial planning and individual and corporate taxation. As a partner in the firm, he has provided business planning, consulting and accounting services to numerous industries, including legal, banking, real estate, trucking, manufacturing, contracting, health care as well as retail business.